developing U.S. biogas industry. While seemingly infantile when compared to other countries’ mature methane-derived energy sectors such as Germany, recent years have seen a development boom inspired by a variety factors, including the U.S. renewable fuel standard. In the Corn Belt, ADM’s RNG project with utility Ameren Illinois will utilize byproduct from its corn processing facility’s wastewater treatment system in Decatur, Illinois. 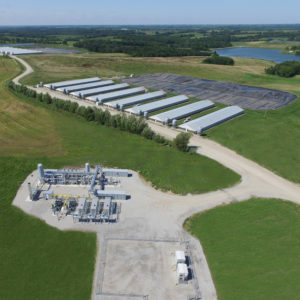 The project will allow Ameren Illinois to distribute RNG from ADM’s corn processing facility into the interstate pipeline system, not long after Ameren’s recent completion of a new, $5.3 million gas control center in Decatur. The project partners are targeting completion of construction in May 2017.